Many guitar players feel lost when it comes time to solo over a heavier song in a metal style. The majority begin to fall back on standard licks and patterns in order to “get through” the solo and only a few are able to consistently come up with great sounding melodies and phrases over any song they play over. Fortunately it doesn't have to be this way for you. When you understand a few basic soloing principles (and know how to apply them) you will see that it isn’t ‘that hard’ to come up with amazing sounding metal guitar solos. Learn how to make your guitar solos fit the song (every time). Find out when is the best time to play fast in a guitar solo. Discover how to predict the emotion of each chord in a chord progression BEFORE the chord is even played (this is easier to do than you might think). Learn how to create awesome phrases that makes your guitar solos sing. 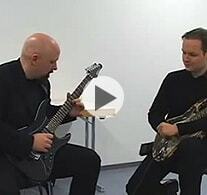 Get INSTANT FREE access to this video lesson about Metal Guitar Soloing now. Simply enter your name and email, then click the "Show Me The Video" button to enter. All of your information is always kept 100% private and confidential.